Cape Town - Parliament's communications portfolio committee on Tuesday recommended four new appointees for the SA Broadcasting Corporation's board. - Media Development and Diversity Agency CEO Lumke Mtimde. 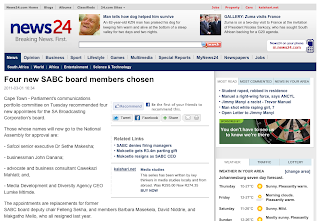 The appointments are replacements for former SABC board deputy chair Felleng Sekha, and members Barbara Masekela, David Niddrie, and Makgatho Mello, who all resigned last year. In a statement on Tuesday, the Democratic Alliance said it had concerns about the nomination of Mtimde. "We must voice our strong concerns over the nomination of ANC and SACP member, Lumko Mtimde, a candidate greatly supported by the ANC Youth League and steamrolled [sic] into this nomination by the ANC despite strong objections over his compromised record on media freedom," DA communications spokesperson Natasha Michael said in a statement. In a column on the ANC's website last year, Mtimde welcomed the ruling party's mooted Media Appeals Tribunal, saying the country "should welcome the proposal and debate its modality such that the outcome serves the intended objectives". Michael said it was "inappropriate" for someone who was in favour of a body that "shuts down and regulates expression and speech" to be appointed to the SABC board. "The public broadcaster should be mandated to relay all information and news accurately and fairly, without any fear of state censorship. "On these grounds, the nomination of Mr Mtimde by an ANC majority vote seems counter-productive, especially given the currently hazardous state of the SABC and its reputation," she said. However, her party was pleased with the nomination of Makhesha. "If approved, we hope she will bring a sense of integrity and even-handedness to the board," she said. 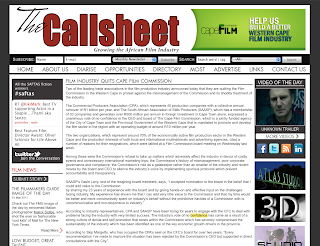 Two of the leading trade associations in the film production industry announced today that they are quitting the Film Commission in the Western Cape in protest against the mismanagement of the Commission and its shoddy treatment of the industry. 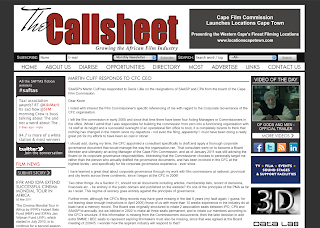 The Commercial Producers Association (CPA), which represents 45 production companies with a collective annual turnover of R1 billion per year, and The South African Association of Stills Producers (SAASP), which has a membership of 30 companies and generates over R500 million per annum in foreign investment in Cape Town alone, expressed a unanimous vote of no confidence in the CEO and board of The Cape Film Commission, which is a jointly funded agency of the City of Cape Town and the Provincial Government of the Western Cape that is mandated to promote and develop the film sector in the region with an operating budget of around R10 million per year. The two organizations, which represent around 70% of the economically active film production sector in the Western Cape and the production interests of both local and international multinationals and advertising agencies, cited a number of reasons for their resignations, which were tabled at a Film Commission board meeting on Wednesday last week. Among these were the Commission’s refusal to take up matters which adversely affect the industry in favour of costly events and unnecessary international marketing trips; the Commission’s history of mismanagement, poor corporate governance and compliance; the Commission’s role as a gatekeeper rather than an enabler of the industry and recent moves by the board and CEO to silence the industry’s voice by implementing spurious protocols which prevent accountability and transparency. 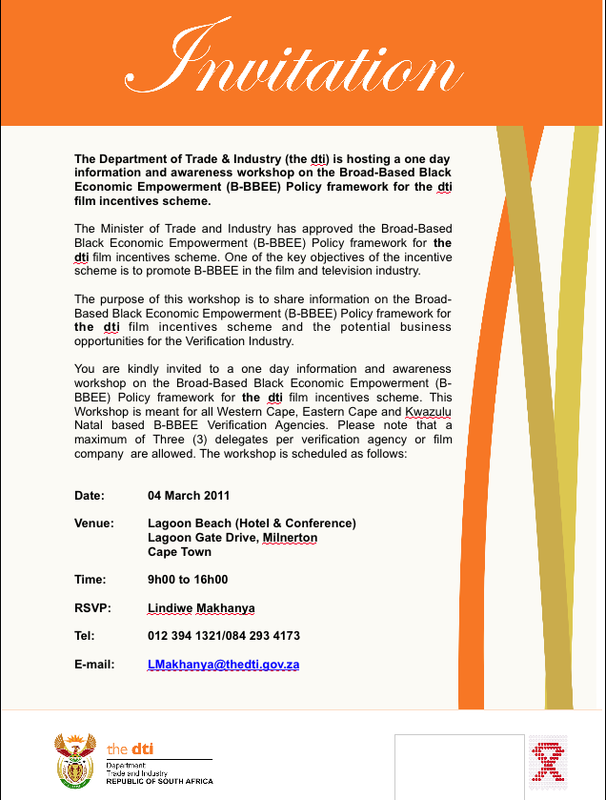 The DTI will be holding one day information and awareness workshops on the Broad-Based Black Economic Empowerment (B-BBEE) Policy framework for the DTI film incentives scheme. The workshops will take place in Cape Town, Durban and Johannesburg. The DTI will discuss the practical application of the policy framework that has recently been approved by the Minister with the B-BBEE verification agents and industry partners. 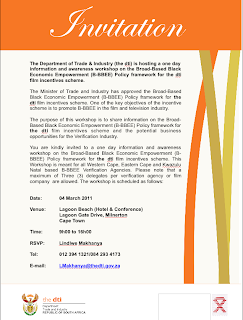 Please click on the invitation above for details of the first of the workshops in Cape Town on 4 March 2011. As someone who has produced content for Cape Town TV or indicated an interest in producing content for Cape Town TV, we would like to invite you to an Industry Dialogue which will be taking place on Friday, 11 March, 2011 on AFDA campus, where CTVs studio is located. The purpose of the Industry Dialogue is to engage with members of the independent television production community on Cape Town Television’s Terms of Trade and commissioning practices and to put out a call for content for specific programmes that we intend to outsource to independent producers. The Industry Dialogue is taking place in the context of a larger "Industry Dialogue" being hosted by Rainbow Circle Films, The Media Development and Diversity Agency (MDDA) and the Cape Town Film Commission on the 11-12 March, 2011. 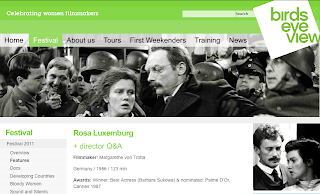 We urge you to look at the full programme attached which we believe will be of great practical benefit to film makers seeking to reinvent their way of operating in the ever-changing context in which we are working today. Specifically, we advise you to attend the workshops on Financing Content and Alternative Distribution Models which we believe will enhance independent producers’ capacity to finance and distribute their own content in partnership with CTV. Should you wish to attend the whole event or part thereof please RSVP info@rainbowcirclefilms.co.za. We look forward to this long overdue opportunity to engage with the television production industry. I had promised to get back to you following my trip to the Berlin Film Festival. The trip was very eventful and worthwhile. On the way to Berlin through London I met with BBC Sport. The BBC had a legacy component built into our agreement with them for the 2010 World Cup. The Head of BBC Sport and Head of Production have agreed to return to Cape Town to give a Master Class on the broadcasting of an event of this magnitude around the world. They have also agreed to incorporate into this presentation on the broadcasting of Formula 1 motor racing both street and circuit races. This will hopefully take place in early May. I was privileged to be invited to a screening of Mama Africa, a documentary on the life of the late Miriam Makeba. The film received an ovation from the 1000+ audience and there are plans to release it with Zulu and Xhosa sub-titles. The CFC is in dialogue with the Producers on how best to show this film locally. Many meeting were held with my counterparts from France, Germany, UK and Italy amongst other countries. Lessons were learnt and ideas exchanged, some of which have already been shared with Cape Town Film Permit Office for adoption. As a direct result of a meeting with the British Film Council I was put in touch with Ealing Studios in London. I met with them on my way back through. They have secured the film rights of three “thriller” novels written by a South African. They are hoping to go into production and film in and around Cape Town later this year. They have already secured a Cape Town based production party and are looking at the viability of filming here. The CFC has offered assistance to the studios and we will advise you in due course what is required locally. In the meantime I am sure you can drop them a line through their web-site. I also met with our representatives at the South African Embassy in Berlin. We have agreed that for next years’ festival we will co-host a South Africa evening in partnership with the festival organisers. This will include showing a couple of local and Co-production films followed by a networking session sponsored by the embassy. MEC Alan Winde is especially excited by this prospect and commented “ This is a tremendous opportunity to showcase the Western Capes’ film industry. It will also give us the opportunity to further develop our relationships with our German Co-production partners. We will be supporting this and look forward to becoming involved once the details have been ironed out”. I am pleased to report that Mr Mansoor Mohammed of the City of Cape Town has committed to increasing the resourcing of the CTFPO and is reviewing and streamlining the process as I write. He is also looking into the possibility of extending the working hours of the team there. The additional resourcing will hopefully be in place for next week. This will lead to an immediate benefit to our members. The proposals is as a direct result of our engagements earlier this month with MEC Winde, Ald. Purchase, Provincial Department of Economic Development and Tourism and Mr Mohammed from the City. The Permit office has also begun the conversion of the permit issue from fax to e-mail. This I understand from members has already proved to be very successful and efficient. I attended a strategic planning session with the City and the Permit office this afternoon. The meeting was extremely productive, the outcomes of which will be announced in more detail next Friday through a joint statement to our members from Mr Mohammed and myself. 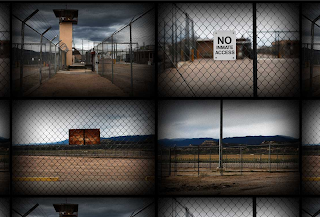 In the meantime we are beginning to develop in earnest a proposal for Micro shoot permits. The CFC is currently reviewing its structures and Corporate Governance matters, this includes the structure of the Board going forward. This review is to improve the running of the CFC and the services we offer to our Members. The implementation of improved and increased Corporate Governance will also lead to more compliant systems and controls leading to better functional management of our office environment. As part of this improvement process we have identified a couple of clauses within the Articles of Association of the CFC which require review. Once these have been commented on with legal opinion, we will advise the Members and request discussion and comments prior to inclusive consultation and implementation. One of the key areas that is being reviewed is the structure of the Board as referred to above. The principal area for discussion being the representation of industry on the CFC Board. It was noted that both the SAAPS and CPA appear to have had representation on the Board for longer than a 2 year period. The Articles state that no organisation or person can have a seat on the board for more than 2 consecutive years. This would be avoided under the proposed changes we are looking to implement in the Articles. I can also advise you that as of this week the CPA and SAAPS and two of their associated members and one of our SMME directors have resigned from the CFC Board. The filling of the vacated seats on the Board is also being reviewed in tandem with legal opinion on the structure of the Board moving forward. Ultimately any decision made will lead to a more balanced and streamlined Board for the future. The CFC have been sponsoring the Design Indaba Film Festival, limited complimentary tickets are available for some of the remaining films such as the Oscar nominated “ Exit through the Gift Shop”. We also have a limited number of complimentary tickets for the Design Indaba main event. Both are available through the web-site. We have had very successful follow up meetings with the NFVF, DTI, National Department of Art and Culture and with MEC Winde and Ald. Purchase. All of these meetings were related to the on-going support for the industry and the CFC. We would like to take this opportunity for the support shown by these agencies and individuals and I look forward to sharing further information on these engagements next month. 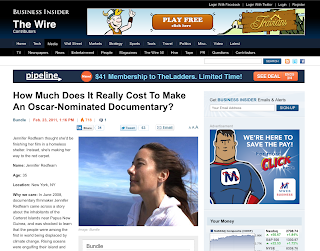 In the meantime, go out there and make some great films and make some money. We are here to assist and support, please contact us anytime. 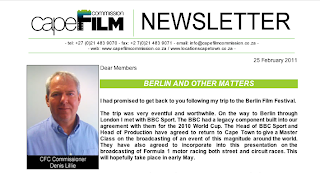 To receive the newsletter, sign-up at the Cape Film Commission's site. My Beautiful Game is a 13 part documentary series that explores African football within its broader historical, cultural and anthropological narratives. 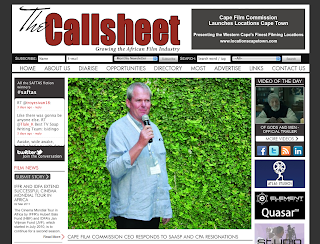 The show covers stories across the entire African continent. There is a kaleidoscope of geography, politics, and national characteristics as one traverses the continent from Cairo to Lagos to Cape Town. The specific, SAFTA nominated episode, Fish Out of Water, is an exploration of the challenges facing African footballers lured over to Europe by lucrative contracts. It looks at the issues of acclimatizing to a foreign environment, the loneliness and the alienation. Directed by Marc Rowlston and produced by Jason Hoff. 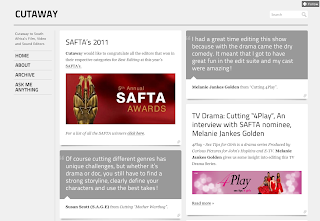 CUTAWAY: How would you describe what makes editing a docci unique to other genres? NIKKI: I think that documentary editing is unique because of the amount problem solving that goes into it. You need to think about narrative, about mood, about pace and about structure – and often you find none of that has been planned, or can be planned. It all happens in post. CUTAWAY: What was the timespan to cut My Beautiful Game? NIKKI: My beautiful Game is a 13 part series, of which I edited 9. I worked on the series for 4 months. CUTAWAY: What format was it shot on? NIKKI: It was shot on the Phantom camera, Bolex and the Sony XDCAM. Read the rest of the at the Cutaway site. The 7th Birds Eye View Film Festival showcases the most inspiring, enchanting and challenging work by international women filmmakers. Highlights include Soul Boy, Kenyan-Ghanian director Hawa Essuman's adventure about a boy who sets out to find who's stolen his father's soul, filmed on location in Nairobi's Kibera slum. Plus new films from around the world, including Susanne Bier's Golden Globe-winning In A Better World and Suha Arraf's insightful and extraordinary Women of Hamas.